Uwe & Colleen love Waltz, love to teach Waltz, and are very excited to bring their favorite Waltz moves and material to Seattle! Expect fun and high energy classes that will help you dance with flow and ease, lead with clarity and follow with grace and pleasure. You will learn beautiful and dynamic moves, from small to big, ready for the social and sometimes crowded dance floor. Colleen and Uwe will address partner connection and pleasant styling. Uwe's simple and short Physics of Waltz demonstrations will show you helpful concepts for your waltz. Colleen will give you simple tools that will make your following flow. 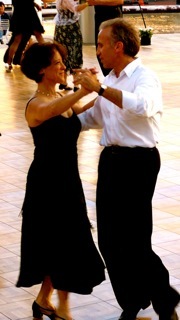 Each class covers beautiful variations for the dance floor, as well as simple and fun skills to benefit your waltz. Dancers should have experience in a turning waltz. Most variations will offer several options of different skill level to challenge everybody. A) 1:15 - 2:20 "FUNdamentals -- Handy, Light & Powerful"
B) 2:30-3:30 "Floating Weave & Exit Strategies"
C) 3:40 - 4:40 "Instructor's Favorites"
There is plenty of parking available on the street or in the adjoining lot. Registration opens at 1:00pm. Come early to sign in, change shoes, stretch, warm up, etc. Dear Seattle Area Waltz Dancers! Colleen and I are very excited to return to Seattle on June 8th 2013. We are concluding another great year of teaching in Portland, with many happy students and lots of new material. With our annual trip to Seattle, we can bring you the very best moves and skill building material of the year. You have our word for a wonderful Waltz workshop and great material for your dancing. P.S. : I reviewed the Seattle material of 2011 and 2012 to assure no repeat of moves. We got plenty of new, beautiful, and very useful things for each workshop.. Skill building exercises are included through all workshops to teach effective set-ups Break times can be used for practice and additional questions and assistance, and for ... actual breaks. C. 3:40 - 4:40 "Instructor's Favorites"